1. Let’s do some houses of the week. Above, the four new homes Tiny Timber has constructed at 1624 Ellis Hollow Road in Dryden. Each home lot is a little over an acre. The subdivision was approved last spring for the wooded parcel a couple miles east of Ithaca, and since then, Tiny Timbers has been busy selling units and lots to buyers. Two were sold in August, one in September, and the last in December. Therefore, this is 100% built out, since the last lot is a conservation lot at the rear (north) end of the property, designed to protect Cascadilla Creek. The units utilize a shared driveway, with spurs for each home. If you want to look at the homes more closely, click to enlarge the photos. A similar plan is underway just up the road at 1540 Ellis Hollow Road, where Tiny Timbers will take a long, narrow undeveloped property and subdivide the land into five home lots and a rear (north) lot protected by a conservation easement. These homes will also be served by a common driveway. This proposal is still going through the review process, and when approved, the time frame for build-out will probably be similar. The home designs are the work of local architecture firm STREAM Collaborative. 2. Over in the village of Lansing, work has started on the next six-unit (hexplex?) at the Heights of Lansing property off of Bomax Drive. It appears that the foundation slab and footers have been formed, poured and insulated with foam boards. 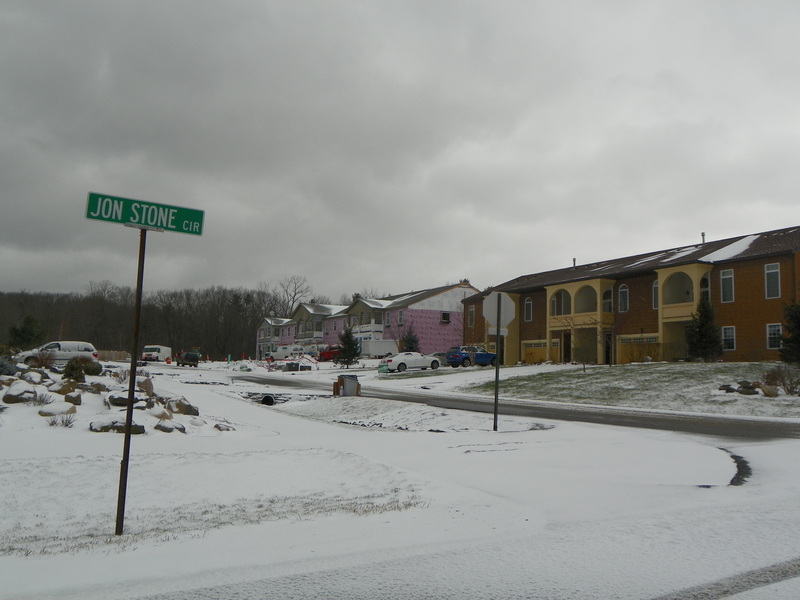 This is the first new townhouse string to be built in the development in six years. Several reasons have been given for the long pause. The developers have said that the natural gas moratorium disrupted and delayed build-out plans. Secondly, the patriarch of Forest City Realty/IJ Construction, Ivar Jonson, passed away in 2014. More recently, the Jonson family (his wife Janet and daughter Lisa Bonniwell) were embroiled in a lawsuit to prevent a zoning change that would allow a market-rate apartment complex to be built down the road. Bonniwell was incensed enough to run for mayor in 2017 in an effort to stop the proposal, but did not win the election. The zoning change has been approved and the apartments were approved in October, but the Park Grove project has yet to move forward. The townhouses were approved along with the last single-family home permit; there were some rather testy exchanges regarding sewer line easements and the installation of street lighting in conjunction with those permits. The lighting has to be in by March 2019. Assuming these are like the other townhouses, expect them to be 3-bedroom units, low 2000s SF with garages, and to go for $350-$450k when they’re finished several months from now. 3. Dryden’s new Rite Aid is coming along. Fully framed, and the plastic in the window openings is likely intended to allow construction crews to work indoors without exposure to the fierce winter elements. The curbing and paving is complete in the parking lot, and it looks like they install metal bollards all around the lot’s perimeter to keep the less-than-attentive from driving into the wall (something that happened to the Nice N’ Easy in my hometown no less than three times before they finally put some in). It is still planned to open in March. 4. Over in Fall Creek, it appears a small apartment building is in line for some major renovations. 1002 North Aurora, a four-unit building built in 1898, had been on the market for $395,000. The seller had owned the property for 24 years, and the price was only slightly above the assessed value of $375,000. On Friday, the property sold for $400,000 to an LLC associated with local developer Modern Living Rentals (Charlie O’Connor et al.). The same day, a building loan agreement was filed from Tioga State Bank to the LLC for $712,000. A lot of that was going towards the land acquisition, and once soft costs are deducted as well, the loan is $287,000. MLR tends to be very transparent about their plans, and a glance at their recently updated website shows the purchase and a ‘information on this project coming soon’. However, they already uploaded the interior renovation plans from STREAM Collaborative. It’s a very thorough interior renovation, and it appears to complete change interior floor plans, with new bedrooms (net gain of one?) as well as new kitchens, bathrooms, and fire rated ceilings. Exterior changes appear to include a renovated fire escape staircase, a couple new windows on the third (top) floor), and a new skylight. While old, this apartment building is a hodge-podge of additions from decades past, so let’s see what a renovation can do to clean things up. It’s plausible the renovations would be complete by August, so they can appeal to students as well as the general market. Quick aside, MLR has a few other “future developments” posted, though none that readers here aren’t already aware of – the 42 townhouse units at 802 Dryden, the proposed 201 North Aurora / Seneca Flats that isn’t moving forward for a while yet, and 217 Columbia, the duplex that unintentionally set South Hill into an uproar. 217 Columbia should be completed this year, and 802 Dryden in summer 2019. 5. It looks like Amici House is finally moving forward. The project, located at 661-701 Spencer Road, received a $3,732,469 loan from the New York State Homeless Housing and Assistance Corporation. The money was announced back in April, and appears to be getting disbursed now. The five-story, 20,710 SF (square-foot) project, approved by the city of Ithaca last January, calls for 23 studio housing units for homeless or vulnerable young individuals in the 18-25 age range. Along with the units and office/function space for local social services non-profit TCAction, the plan also calls for a 7,010 SF early heard start facility, called the “Harriet Gianellis Childcare Center”, that will house five classrooms, kitchen and restrooms, and an outdoor play area. The childcare facility will serve 48 low-to-moderate income families and create up to 21 jobs. Recently, the HGCC applied for a low-interest loan from the IURA, $90,690 to help cover unanticipated moving expenses associated with the project. TCAction thought they could stay on-site during construction, but the contractor said otherwise, so they’ll be 609 W. Clinton while the new Amici House is built. The loan says it will generate three jobs, but that’s more a technical stipulation than an actual figure associated with the project. The funding for the childcare appears to be separate, $1,325,000 already approved by the state, $603,000 from M&T Bank, and $84,200 from a standing IURA loan. It is fully funded, although it is not completely clear if it will be built concurrently with the housing (the likely answer is yes). I thought tiny houses were supposed to be somehow more efficient / environmentally friendly. Sprawling on subdivisions with acre (!) sized lots seems to go against that.